This past Thursday at SOMArts was the opening reception of our latest exhibit It’s All A Blur. The highlight of the night was a performance that took place on a giant green screen stage erected in our Main Gallery. 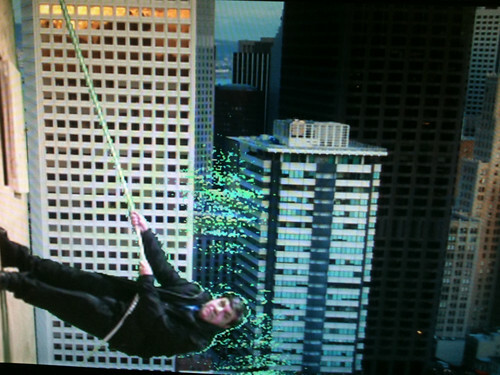 The green screen was conceived by artist Tony Labat and was created to look like a cityscape that when walked across resembled scaling the side of a building. The performance and all subsequent hijinks on the stage were streamed live online. Not wanting to get left out of the action I shot a video of Lex and Rene having some fun in the piece.